The Trinity can be a difficult concept for anyone to grasp, but it is especially tough for youngsters who tend to be quite literal-minded. The transfiguration of Jesus offers a glimpse of the Trinity, as well as a wild display of God’s glory and confirmation of who Christ is. Needless to say, nothing is simple about this event, but we can emphasize elements of it for kids that will create a practical and meaningful lesson. 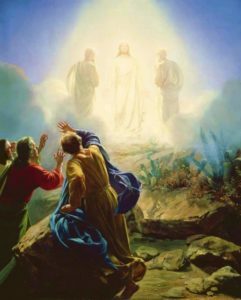 These activities look at the Transfiguration and also prepare our hearts for the coming of Lent and examination of Jesus. Lesson focus: God has a plan and purpose for each life He created. Even though we have doubts and fears, God will help us to complete His work. Lesson Opening: Listen closely…start out with a bit of a listening exercise…have students get very quiet, and start by making a loud noise like a block or clapping. Then make a smaller noise (snap or whistle). Then make a very small noise (drop a piece of paper or pin on the floor). Ask, “Did you have to listen carefully to hear the smallest noise?” For older students, you may opt to go in another room (or have a student do so) and make a noise, challenging them to guess what it is you are doing. Explain that today we will be talking about listening, and how disciples had to listen carefully to what Jesus told them about who He was. Begin with a little word game: write the word “transfiguration” on a board, and have students come up with as many words as possible using the letters in it. This can be done with white boards, paper, or just called out. For younger students, brainstorm words that begin with the letter “P.” Ask students if they have heard of this word before, and what they think it might mean. Display a picture of a butterfly and talk about how it transforms and changes from a wormy little caterpillar to a beautiful butterfly. That is like a transfiguration of sorts. And it’s what God does in our lives when we let Him into our hearts. In today’s story, it happens to Jesus! Pass out blobs of Play-doh to have students help tell the story. To start, have them form the clay into a mountain. So what happened here? Peter, James and John just went into a cloud and found Jesus? Was it a foggy day? Of course not…here we see GOD announce, with the Holy Spirit, that Jesus the Son is the chosen One and to be heeded. When God talks, it can be frightening. The disciples were scared, but they knew to listen anyway. And why do you think they didn’t tell anyone about the vision? (Take various answer guesses, especially for older students). Have students transfigure the Play-Do into a cloud. What do kids think they would have done on that mountaintop? What do they think happened after the disciples came down? As answer incentive, you may choose to pass out large marshmallow prizes for those who respond. Rising through the clouds…discuss again the cloud covering and what it meant. Whose voice came out of the cloud? Instruct students to make a cloud collage. Provide paper (preferably darker colors) and plenty of cloud-like items: cotton balls, baby marshmallows, foam, white crayons…allow plenty of time (and glue) to get creative and go wild with clouds. Attach a verse caption and glitter if feeling brave. Close with prayer and thanks to God for giving us Jesus and all of His blessings. Ask for strength and sincere contemplation. Love this and how fun would the nugget of competition be to overlay literacy with listening skills. Great contrast with opposites during Bible lesson. Hooray for word puzzles within Sunday School lessons! Tony Kummer (Editor) reviewed & updated this page on : March 4, 2019 at 10:24 am. All our content is peer reviewed by our readers, simply leave a comment on any post suggest an update.